RNMDSF Senior Superintendent Aubrey Jamieson (left), cuts the ribbon to the refurbished facility watched by Peterhead Mission Superintendent Steve Murray. Peterhead’s Fishermen’s Mission unveiled its new look facility earlier this week. The refurbished offices and 24/7 lounge were officially opened on Tuesday by Senior Superintendent Aubrey Jamieson from Lerwick. The modern 24/7 lounge fitted out with comfy furnishings and a large television. The £50,000 makeover has seen the former garage transformed into an office and a complete refurbishment of the first floor, housing a toilet and shower area, lounge with computers, tablets with headphones, television and good wifi connections. A kitchen and dining area provides facilities for hot and cold drinks and a microwave. There is also a small lounge at the front of the building, complete with sofas and a bird’s eye view of the new fishmarket at the harbour. Peterhead’s Mission Superintendent Steve Murray told the Buchanie: “So many foreign fishermen are working on boats fishing out of Peterhead, and this refurbishment provides a comfortable and good quality environment for them to relax in. “They work hard and it is only right that we do the best we can for them, to just show them some respect and appreciation. The well equipped dining area. “Assistant Superintendent David Haggath will be coming down to man the lounge area one night a week - we will work with the fishermen to see what night is best for them and to see what other needs they require. “We reckon there are between 300 to 400 foreign lads who work out of Peterhead - mostly Filipino and Ghanaian - but the facility isn’t just for them, it’s open to all fishermen who utilise Peterhead Port,” he said. 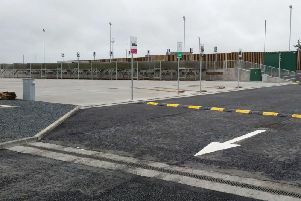 “The facility only opened a couple of weeks ago as we had to ensure that all the works were completed and the area safe to use. “However, the initial reaction from those who have used it has been very positive - they love it!” he said. As well as the new-look layout, the facility has upgraded its wi-fi, allowing the foreign fishermen to easily keep in touch with family members. Work took around four months to complete, with the contract awarded to local firm Rob Buchan Joiners. The refurbishment cost the Fishermen’s Mission in excess of £50,000, but on top of that a lot of money has also been spent by the new landlord on the building since the sale last year. Officially opening the facility, Superintendent Jamieson said: “It’s a real privilege to be here to share in this event today and see the great work that’s been done and all the progress. “Fishing remains the most dangerous occupation that you can do in the UK and our fishermen face danger and difficulty on a daily basis. “With the Mission we want them to feel that they’re not alone and when times are tough we’re here to care for them in a whole variety of different ways. “The Fishermen’s Mission has had a long and active history in Peterhead port. The work here is varied and often very demanding. It may be that in the months and years to come the workload of the Mission will actually increase. He thanked the organisations who helped fund the refurbishment - Merchant Navy Welfare Board, Trinity House, Scottish Fishermen’s Federation and Apex Church in Peterhead. He then said a prayer before dedicating the new facility to the port.